Kingsway International Christian Centre (KICC) is based in Chatham, Kent within a 24-acre site. It was established in 1992. The church currently has up to 12,000 people in attendance and is the largest in the UK. KICC is pastored by Senior Pastor, Matthew Ashimolowo, who is known throughout the world as a renowned Pastor and Businessman. KICC run various free events throughout the year, from IGOC (International Gathering of Champions) and The Buzz, a gospel music event. These events have been running for many years and attract thousands of people. KICC wanted to attract new audiences to these events, as well as attracting attendees from past events, our challenge was to reach new audiences in an arena that KICC already dominates. To reach new audiences, TMH offered 48 sheet billboards and bus rears positioned within prime locations around their main headquarters in Chatham and East London and the use of digital billboards in the main town centre of Chatham. This was to encourage locals to attend the events which offered free transport from various locations around Kent and East London. 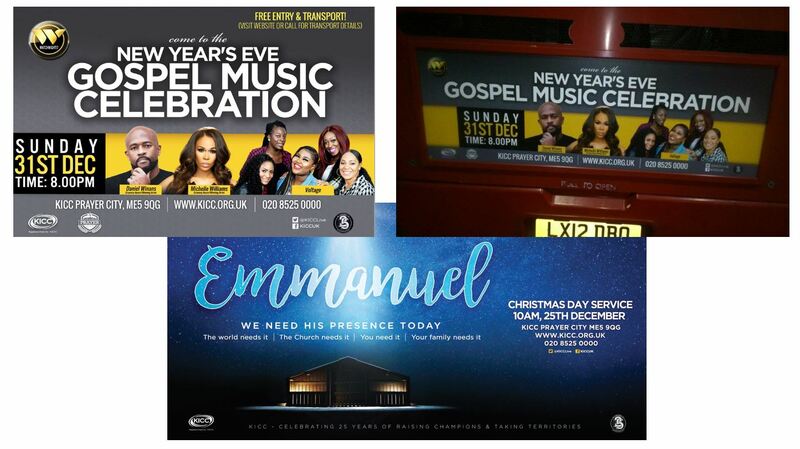 Backed up with printed adverts in the London Metro and 60” TV adverts, inviting people to attend the free events, which were placed on Christian Channels and black entertainment channels, assisting the church to reach out to other targeted audiences around the UK. By targeting their local community we were able to reach an obvious but not previously targeted audience to attend KICC’s events. The billboards and bus rear campaigns provided the perfect reach to their local market and a high OTS. Both events were filled to maximum capacity. Church members have also increased as a direct result of these two events.